Fianna Fail has selected Cllr Rob Power and Noel Heavey to run in the local elections in the new Newbridge District. Last night Fianna Fail members gathered in the Keadeen Hotel to choose their candidates for next May’s local elections. Sitting councillor for Newbridge and Mayor of Kildare, Sean Power did not contest the convention, having previously announced that he would stand down at the end of this term. His son, Robert, will now take up the mantle in the Newbridge area, half of which has been moved from the Naas district where he has been a councillor since 2014. The new district takes in Caragh, Ladytown, Kilcullen, Brannockstown and Twomilehouse formerly of the Naas local electoral area. It also includes Clongorey, Athgarvan and of course the town of Newbridge itself. Newbridge's Cllr Murty Aspell and Antoinette Buckley from Kilcullen also contested the selection convention. Dep Fiona O'Loughlin said; "It is always a positive sight to see four candidates contesting for two places for the local elections in May 2019. Local politics is vital for local communities and it’s important to keep people engaged in politics. 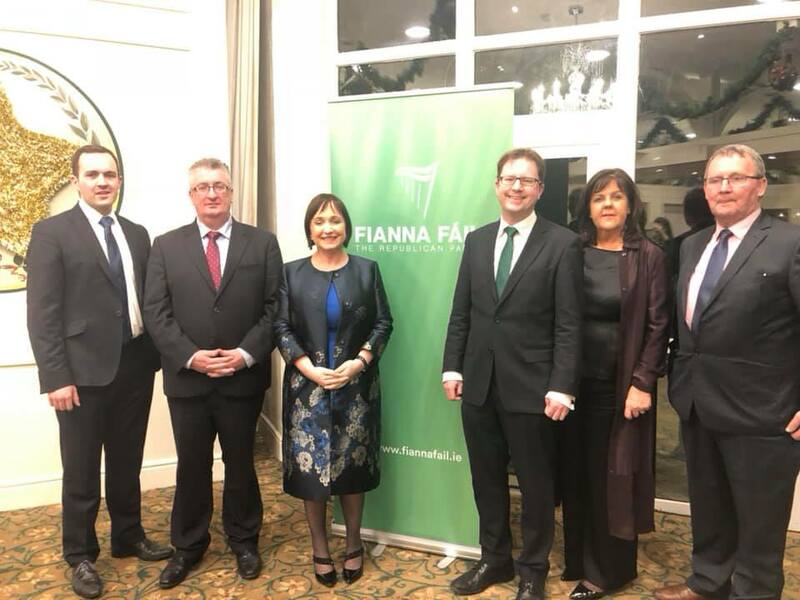 I want to congratulate Cllr Rob Power and Noel Heavey on their selection last night by the grassroots members of Fianna Fáil in the Newbridge MD area. “Commiserations to Antoinette Buckley and sitting councillor for the Newbridge area, Murty Aspell who were not successful on the night. There is every chance that there will be further additions to the ticket early into 2019 given the increase in councillors for the Newbridge MD area”. Both Power and Heavey now go forward to be ratified as Fianna Fail candidates and are expected to be joined by a third candidate likely to be either Cllr Aspell or Buckley from Kilcullen. Heavey is known for his commitment to community activities. Currently serving on the committee of June Fest Newbridge, he has been chairperson for the past five years. He also served for eleven years on the Executive of Newbridge RFC, spearheading the development of its facility in Rosetown. From this connection emerged the twinning of Newbridge with Argentre-Du-Plessiss, a small town in Brittany of which Heavey was chairperson 2012-2017. Having taught for 15 years in St. Farnan’s Post Primary School, Prosperous, he took early retirement to go into the mushroom business. As Managing Director of Miltonfield Ltd, he developed this to become a major supplier of mushroom products to the Irish multiple retail trade. Married to Bernadette, he is a native and resident of Clongorey where they raised their family of five, Nollaig, Liam, Sorcha, Aileen and Eamon.